Win. Dance. Repeat. These are the words that Boston Red Sox fans lived by in the 2016 MLB season, and the words that they continue to live by as 2017 takes its hold this spring. The energy between outfielders Jackie Bradley Jr., Mookie Betts and Andrew Benintendi is electric, and fans love to eat up their cocky post-win celebrations as much as they do Fenway Franks. The Red Sox are doing something right here, and it is time other teams take notice. I have certainly exhausted many people’s ears by talking about the impending death of baseball, but it certainly doesn’t have to be that way. Yes, we can discuss the slow pace of the sport, length of the game and longevity of the regular season, but it is more than that. The Chicago Cubs and Cleveland Indians World Series game received amazing viewership this past fall, viewership that the MLB has been striving for in the past few years. But how can they harness that kind of excitement about baseball again? Well, just ask the Boston Red Sox. There’s a generation gap in the MLB’s viewership, no doubt. Baby boomers and Generation X love the game because they were born when baseball truly was America’s favorite pastime. They were born before the celebrity status of standout athletes like LeBron James grew, and before football dominated not just every Sunday, but every Sunday, Monday and Thursday. They were born in the times of Carl Yastrzemski and the Curse of the Bambino, in the times of Roger “Rocket” Clemens and boxes of Crackerjacks. It was different then, and it is harder now more than ever to spark an interest in baseball again. But the Sox seem to understand the audience they are missing and how they are going to target them. They have already gotten a hold on the post-2005 kids by growing their Kid Nation following (an extension of Red Sox Nation) and focusing on starting the new generation’s interest in baseball young. But their real strength in getting millennials interested is by marketing their young guys on social media. And they have done a great job at that. The win, dance, repeat phenomenon was enjoyed nationwide both this season and last because of the sheer fun of it all. Between the Red Sox starting a hashtag for the three boys and creating gifs of them after every win, millennials could finally be a part of baseball again without sitting through long games. They could be a part of the Red Sox with a simple retweet. 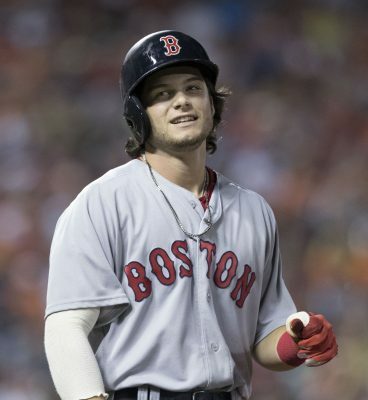 Instead of creating buzz only during a series against the Yankees (or apparently against the Cubs and Orioles, this season), they could get excited about a Sox win against Tampa Bay or Detroit because of a Mookie Betts flex or an Andrew Benintendi hair flip. Better yet, Sox fans on social media can get excited about the team on non-game days. The Sox have begun tweeting and posting #MondayMotivation pictures and reposting comments from fans, something that other teams need to start doing. They even have team question-and-answer’s on their social media sites for fans to have direct conversations with their favorite players, and it’s something so casual and simple that these players and teams don’t feel untouchable anymore — they feel perfectly in reach. Last week, David Price and Steven Wright stood in an ice cream truck on an off-day and handed out ice cream to pedestrians. Hanley Ramirez tweeted at the Barstool BU account that Saturdays are “for the boys.” And fans all rallied around the team after a jumbotron proposal went wrong on Sunday. These are all things that have nothing to do with the actual game, but they are fun. Between this, the supposed new rivalry between the Sox and the Orioles (come on, Matt Barnes, that is on you), and a stellar two out of three win series against Chicago, the Sox have had more attention from fans than they have had in years. And keep in mind, this is post-retirement from perhaps the most famous Red Sox player ever, David “Big Papi” Ortiz. As far as I’m concerned, the Red Sox are leading the charge right now in the revamping of baseball. With a young, fun team behind them, a growing fan following on social media and successful targets of the younger generations, it is no longer valid to say that baseball is dying. Now, more than ever, it is quite the opposite.